This 1970 Plymouth Superbird Re-creation Resto-Mod, nicknamed “The White Monster,” is an over-the-top build with thousands of hours invested. The Nelson Racing engine is a fully polished all-aluminum 572ci twin-turbo HEMI boasting a capable of more than 1300hp on race fuel, and operates on a pump-gas-friendly system. The Octane-on-Demand fuel system consists of a dual-bladder fuel tank, allowing the engine to operate on both 91 pump gas as well as race gas when the need for “Boost” should arise. Every part of the body has been modified or built from scratch. The rocker panels are extended and wrap around to connect and become smooth with the Art Morrison Max-G frame rails, the underbody has been cookie-sheeted for a smooth seamless appearance, the front original steel Mopar nose cone has been tucked and gapped flush with the front fenders, the headlight doors operate on electric actuators, the twin fabricated water-to-air intercoolers are concealed neatly inside the nose cone, and all the turbo and intake tubes are fully polished pieces, along with the billet Anteater intake manifold. The scratch-built TIG-welded 3.5” exhaust system is finished in bright polished ceramic jet-coating; all the floor pans, tubs, rockers and firewall are all hand-formed pieces; the rear wing is hand-formed from sheet aluminum for light weight and durability; the rear window plug is also fabricated sheet metal; all-new glass and Electralife power windows were used; and the hood extension and lower front fenders are handmade pieces. Halogen lighting headlamps up front with DIGI-TAILS taillights in back. After its modification, the body was finished in PPG custom-mixed Envirobased paint and a specialty satin clear coat. Under the hood, concealed in the completely smoothed engine compartment, is the dry sump oiling system, huge Ron Davis custom radiator and dual Spal fans, as well as the Vintage Air heating and cooling system. A full race-prepped 4-speed 4L80E automatic transmission is operated by a Compushift electrical system. A full set of Wilwood 13” 4-wheel discs and 6-piston caliper braking system is attached to an articulated floor-mounted brake pedal and master cylinder assembly to employ the stopping power. Underneath is a Currie Enterprises custom 9” rear end with triangulated 4-link Strange axles, 3:55 posi-traction gear set and a chromoly driveshaft. The car sits on Budnik 18x8” and 20x12” polished wheels wrapped in massive Mickey Thomson rubber. The stock appearing interior received many modifications to accommodate the new floors and structures, as well as the 4-point roll cage. 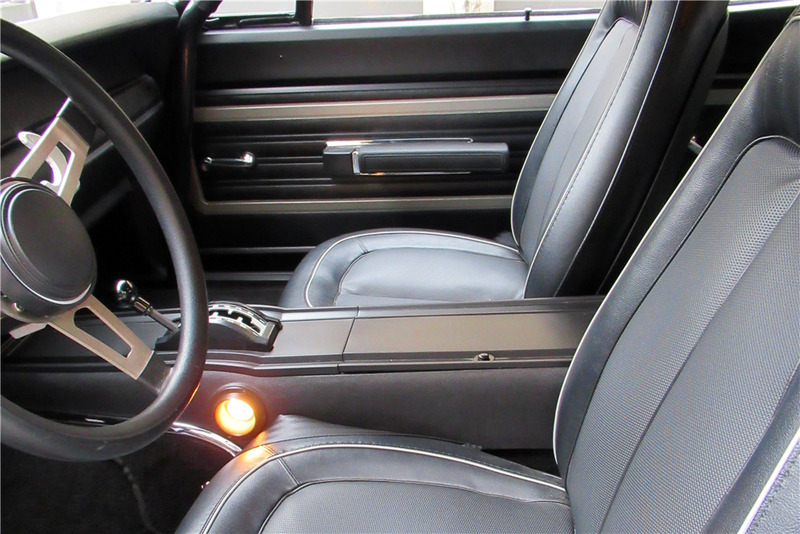 It sports a RetroSound audio system, air conditioning, Dakota Digital gauges and optional paddle-shifted transmission.